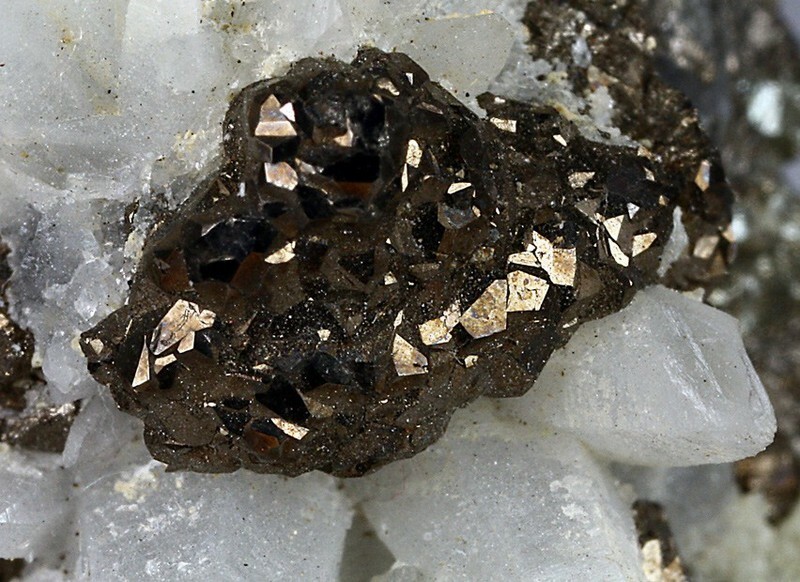 Colusite: Mineral information, data and localities. 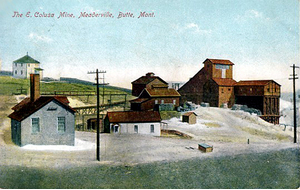 Named by R. E. Landon and A. H. Mogilnor in 1933 after the type locality, the East Colusa Mine in Butte, Montana, USA. Forms a solid-solution series with stibiocolusite. Extremely brittle mineral, breakage looks as though fractures permeate the freshly broken surface when viewed with 30X manification. Granular, massive, tetrahedral crystals; also complex pyritohedrons at type locality. Quartz 20 photos of Colusite associated with Quartz on mindat.org. Sphalerite 17 photos of Colusite associated with Sphalerite on mindat.org. Pyrite 10 photos of Colusite associated with Pyrite on mindat.org. Enargite 9 photos of Colusite associated with Enargite on mindat.org. Wurtzite 7 photos of Colusite associated with Wurtzite on mindat.org. Bornite 3 photos of Colusite associated with Bornite on mindat.org. Gypsum 3 photos of Colusite associated with Gypsum on mindat.org. Greenockite 3 photos of Colusite associated with Greenockite on mindat.org. Chalcopyrite 3 photos of Colusite associated with Chalcopyrite on mindat.org. Sulvanite 2 photos of Colusite associated with Sulvanite on mindat.org. Schneiderhohn, Hans and Ramdohr, Paul (1931) Lehrbuch Erzmikroskopie. Landon, R.E., Mogilnor, A.H. (1933) Colusite, a new mineral of the sphalerite group. American Mineralogist: 18: 528-533. Zachariasen, W.H. (1933) X-ray examination of colusite, (Cu,Fe,Mo,Sn)4(S,As,Te)3-4. American Mineralogist: 18: 534-537. Nelson, R. (1939) Colusite—its occurrence, paragenesis and genetic significance. American Mineralogist: 24: 369-376. Berman, H., Gonyer, F.A. (1939) Re-examination of colusite. American Mineralogist: 24: 377-381. Palache, C., Berman, H., Frondel, C. (1944) The System of Mineralogy of James Dwight Dana and Edward Salisbury Dana Yale University 1837-1892, Volume I: Elements, Sulfides, Sulfosalts, Oxides. John Wiley and Sons, Inc., New York. 7th edition, revised and enlarged: 386-387. Lévy, C. (1967) Contribution a la minéralogie des sulfures de cuivre du type Cu3XS4. Mémoires du Bureau de Recherches Géologiques et Minières: 54: 1-178. Fleischer, M. (1968) New mineral names. American Mineralogist: 53: 2103-2106. Orlandi, P., Merlino, S., Duchi, G., Vezzalini, G. (1981) Colusite: a new occurrence and crystal chemistry. The Canadian Mineralogist: 19: 423-427. Spry, P.G., Merlino, S., Wang, S., Zhang, X., Buseck, P.R. (1994) New occurrences and reﬁned crystal chemistry of colusite, with comparisons to arsenosulvanite. American Mineralogist: 79: 750-762. Frank-Kamenetskaya, O.V., Rozhdenstvenskaya, I.V., Yanulova, L.A. (2002) New data on the crystal structures of colusites and arsenosulvanites. Journal of Structural Chemistry: 43: 89-100. Wagner, T., Monecke, T. (2005) Germanium-bearing colusite from the Waterloo volcanic-rock-hosted massive sulfide deposit, Australia: crystal chemistry and formation of colusite-group minerals. The Canadian Mineralogist: 43: 655-669. Milka K. de Brodtkorb (2002) Las Especies Minerales de la Republica Argentina. Vol. 1 (elements, sulphides and sulphosalts). (Asociacion Mineralogica Argentina); DE BRODTKORB, Milka K. Precious metaltellurides and other Te-bearing minerals in different paragenesis of Argentina: A review. Rev. Asoc. Geol. Argent. [online]. 2009, vol.64, n.3, pp. 365-372.; Hubert, P., Werner, H., & Dan, T. (2009). A contribution to the knowledge of the mineralization at Mina Capillitas, Catamarca. Revista de la Asociacion Geologica Argentina, 64(3), 514-524. Paar, W. H., Putz, H., Topa, D., de Brodtkorb, M. K., & Sureda, R. J. (2005, January). Occurrence and paragenesis of tellurium in mineral deposits of Argentina. In Mineral Deposit Research: Meeting the Global Challenge (pp. 1419-1422). Springer Berlin Heidelberg. Mederer, J., Moritz, R., Zohrabyan, S., Vardanyan, A., Melkonyan, R., & Ulianov, A. (2014). Base and precious metal mineralization in Middle Jurassic rocks of the Lesser Caucasus: A review of geology and metallogeny and new data from the Kapan, Alaverdi and Mehmana districts. Ore Geology Reviews, 58, 185-207. Wagner, T., Monecke, T. (2005) Germanium-bearing colusite from the Waterloo volcanic-rock-hosted massive sulfide deposit, Australia: Crystal chemistry and formation of colusite group minerals. Can. Mineral., 43, 655-669. 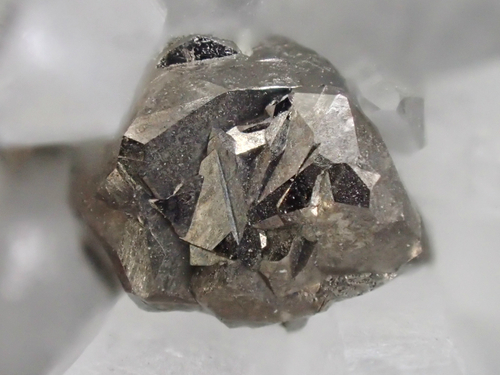 Kouzmanov, K., Moritz, R., von Quadt, A., Chiaradia, M., Peytcheva, I., Fontignie, D., Ramboz, C., and Bogdanov, K. (2009): Mineralium Deposita 44, 611-646. KOUZMANOV, K., RAMBOZ, C., BAILLY, L. & BOGDANOV, K. (2004): Genesis of high sulfidation vinciennite-bearing Cu-As-Sn (±Au) assemblage from the Radka epithermal copper deposit, Bulgaria: Evidence from mineralogy and infrared microthermometry of enargite. Can. Mineral. 42, 1501-1521.; Kouzmanov, K. (2004). Galena-bearing myrmekitic intergrowths from the Radka deposit, Bulgaria: Origin and mechanisms of formation. Geochemistry, Mineralogy and Petrology, 41, 17-30.; Cook, N. J., Ciobanu, C. L., & Bogdanov, K. (2002) Trace mineralogy of the Upper Cretaceous banatitic Magmatic and metallogenetic Belt, SE Europe. In 11th Quadrennial IAGOD symposium–Geocongress 2002, Windhoek, Namibia, July 2002. CD Volume of extended abstracts. Strashimirov, S., Petrunov, R., and Kanazirski, M. (2002): Mineralium Deposita 37, 587-598.; Singer, D.A., Berger, V.I., and Moring, B.C. (2008): US Geological Survey Open-File Report 2008-1155.; Petko Popov, Strashimir Strashimirov, Kamen Popov, Milko Kanazirski, Kamen Bogdanov, Radi Radichev, Stefan Dimovski, Stanislav Stoykov (2012) Geology and Metallogeny of the Panagurishte Ore Region. pp192-227; Cook, N. J., Ciobanu, C. L., & Bogdanov, K. (2002) Trace mineralogy of the Upper Cretaceous banatitic Magmatic and metallogenetic Belt, SE Europe. In 11th Quadrennial IAGOD symposium–Geocongress 2002, Windhoek, Namibia, July 2002. CD Volume of extended abstracts. Strashimirov, S., Petrunov, R., and Kanazirski, M. (2002): Mineralium Deposita 37, 587-598.; Singer, D.A., Berger, V.I., and Moring, B.C. (2008): US Geological Survey Open-File Report 2008-1155; Cook, N. J., Ciobanu, C. L., & Bogdanov, K. (2002) Trace mineralogy of the Upper Cretaceous banatitic Magmatic and metallogenetic Belt, SE Europe. In 11th Quadrennial IAGOD symposium–Geocongress 2002, Windhoek, Namibia, July 2002. CD Volume of extended abstracts. Moritz, R., Kouzmanov, K., & Petrunov, R. (2004). Late Cretaceous Cu–Au epithermal deposits of the Panagyurishte district, Srednogorie zone, Bulgaria. Swiss Bulletin of Mineralogy and Petrology, 84(1), 79-99.; Cook, N. J., Ciobanu, C. L., & Bogdanov, K. (2002) Trace mineralogy of the Upper Cretaceous banatitic Magmatic and metallogenetic Belt, SE Europe. In 11th Quadrennial IAGOD symposium–Geocongress 2002, Windhoek, Namibia, July 2002. CD Volume of extended abstracts. Anthony, Bideaux, Bladh, Nichols: "Handbook of Mineralogy", Vol. 1, 1990; American Mineralogist (1966): 51: 29-36; Bonev, I.K. ; Petrunov, R.; Cook, N. J.; Ciobanu, C. L. (2005): Kostovite and its argentian varieties: Deposits and mineral associations. Bulgarian Academy of Sciences, Geochemistry, Mineralogy and Petrology. 42, 1-22; Cook, N. J., Ciobanu, C. L., & Bogdanov, K. (2002) Trace mineralogy of the Upper Cretaceous banatitic Magmatic and metallogenetic Belt, SE Europe. In 11th Quadrennial IAGOD symposium–Geocongress 2002, Windhoek, Namibia, July 2002. CD Volume of extended abstracts. Dube, B., Dunning, G. R., & Lauziere, K. (1998). Geology of the Hope Brook Mine, Newfoundland, Canada; a preserved late Proterozoic high-sulfidation epithermal gold deposit and its implications for exploration. Economic Geology, 93(4), 405-436. Liu Wenyuan, Dong Cheng, Gu Xiangping, Liu Yu, Qiu Xiaoping, and Chen Yuchuan (2014): The crystal structure of kiddcreekite solved using micro X-ray diffraction and the EPCryst program. Mineralogical Magazine, 78, 1517-1525. WANG, Y., TANG, J., WANG, Q., DUAN, J., FANG, X., SUN, X. and YIN, X. (2014), The Mineralized Features and Prospecting Breakthrough of Southern Tiegelong Giant Epithermal Copper (Gold, Silver) Deposit, Tibet. Acta Geologica Sinica, 88: 802–803. Voudouris, P. (2006): A comparative mineralogical study of Te-rich magmatic-hydrothermal systems in northeastern Greece. Mineral. Petrol., 87, 241–275. ; Repstock, A., Voudouris, P., & Kolitsch, U. (2015). New occurrences of watanabeite, colusite,“arsenosulvanite” and “Cu-excess” tetrahedrite-tennantite at the Pefka high-sulfidation epithermal deposit, northeastern Greece. Neues Jahrbuch für Mineralogie-Abhandlungen: Journal of Mineralogy and Geochemistry, 192(2), 135-149. Mavrogonatos, C., Voudouris, P., Spry , P.G., Melfos, V., Klemme, S., Berndt, J., Baker, T., Moritz, R., Bissig, T., Monecke, T. & Zaccarini, F. (2018): Mineralogical study of the advanced argillic alteration zone at the Konos Hill Mo–Cu–Re–Au porphyry prospect, NE Greece. Minerals 8, 479. Ortelli, M., Moritz, R., Voudouris, P., & Spangenberg, J. (2009). Tertiary porphyry and epithermal association of the Sapes-Kassiteres district, Eastern Rhodopes, Greece. Smart Science for Exploration and Mining, 536-538. Pollard, P. J., & Taylor, R. G. (2002). Paragenesis of the Grasberg Cu–Au deposit, Irian Jaya, Indonesia: results from logging section 13. Mineralium Deposita, 37(1), 117-136. Orlandi et al., 1996. Minerals of the Seravezza Marble, Tuscany, Italy. Mineralogical Record, 27: 47-58. ; Orlandi, P. & Criscuolo, A. (2009). Minerali del marmo delle Alpi Apuane. Pacini editore, Pisa, 180 pp. Orlandi, P., Criscuolo, A. (2009) Minerali del marmo delle Alpi Apuane. Pacini Editore, Pisa, 180 pp. Orlandi P., Franzini M., 1994. I minerali del marmo di Carrara. Amilcare Pizzi S.p.A., Milano. ; Morino A., Passarino G. (2016): Minerali nel marmo di Carrara: solfuri e solfosali. Riv. Mineral. Ital., 40, 1 (1-2016), 22-33. Orlandi, P., Bracci, G., Dalena, D., Duchi, G., and Vezzalini, G. (1980) I minerali delle geodi della formazione marmifera di Carrara. Atti della Società Toscana di Scienze Naturali, Memorie, serie A, 87, 93-124. Orlandi, P., Bracci, G., Dalena, D., Duchi, G., and Vezzalini, G. (1980) I minerali delle geodi della formazione marmifera di Carrara. Atti della Società Toscana di Scienze Naturali, Memorie, serie A, 87, 93-124; Orlandi, P., and Franzini, M. (1994) I minerali del marmo di Carrara. Cassa di Risparmio di Carrara - Amilcare Pizzi Editore S.p.A., Milano, 109 pp. Biagioni C., Orlandi P., Camarda S., Chinellato M., Appiani R., Del Chiaro L., Sanguineti G., (2019) Minerals from marbles of Carrara and the Apuan Alps. Page 45; Orlandi, P., Bracci, G., Dalena, D., Duchi, G., and Vezzalini, G. (1980) I minerali delle geodi della formazione marmifera di Carrara. Atti della Società Toscana di Scienze Naturali, Memorie, serie A, 87, 93-124. Bombarda, L., Granai, F., and Orlandi, P. (1999) Le cave di Val Bona e Val Pulita. Rivista Mineralogica Italiana, 23, 2 (2-1999), 100-102; Morino A., and Passarino G. (2016) Minerali nel marmo di Carrara: solfuri e solfosali. Rivista Mineralogica Italiana, 40, 1 (1-2016), 22-33. Komuro, K., & Kajiwara, Y. (2004). Germanium‐bearing Colusite in Siliceous Black Ore from the Ezuri Kuroko Deposit, Hokuroku District, Japan. Resource Geology, 54(4), 447-452. CHIMIZU, M. (1993). On nekrasovite, chatkalite, kuramite-stannite, colusite and stannoidite from the Suttsu mine, Hokkaido. A Study on Ore Textures by Optical Microscopy and EPMA. Kampunzu, A.B., Cailteux, J.L.H., Kamona, A.F., Intiomale, M.M., and Melcher, F. (2009): Ore Geology Reviews 35, 263-297.; Melcher, F., Oberthür, T., Rammlmair, D. (2006): Geochemical and mineralogical distribution of germanium in the Khusib Springs Cu-Zn-Pb-Ag sulphide deposit, Otavi Mountain Land, Namibia. Ore Geology Reviews 28, 32-56. Tasev, G. (2010): Metallogeny of the polymetallic ore bearing system Bukovik-Kadiica. PhD thesis, University “Goce Delčev”, Štip, Faculty of Mining, Geology and Polytechnics, 207 pp. ; Serafimovski, T., Tasev, G., Stefanova, V. (2015): Mineral assemblages group of major and associated mineral phases in the Kadiica porphyry copper deposit, eastern Macedonia. Geologica Macedonica 25, 183-196. Neumann, H. (1985) Norges Mineraler. Norges geologiske Undersøkelse Skrifter 68 p. 23. Cabri, L. J., Gaspar, O. C., Lastra, R., & McMahon, G. (1998). Distribution of gold in tin-rich samples from the Corvo orebody, Portugal. The Canadian Mineralogist, 36(5), 1347-1360. Okrugin, V., & Chernev, I. Correlation of Epithermal and Geothermal Deposits (an Example of Mutnovsky Geothermal Area, Southern Kamchatka). Proceedings World Geothermal Congress 2015 ; Okrugin, V. M. (2004). Miocene to Quaternary center volcanic, hydrothermal and ore-forming activity in the Southern Kamchatka. In Metallogeny of the Pacific Northwest (Russian Far East)-Tectonics, Magmatism and Metallogeny of Active Continental Margin, Interim IAGOD Conference, Excursion Guidebook, Dalnauka, Vladivostok, 2004 (pp. 147-176). Buttinger-Kreuzhuber, T., Kolitsch, U., Pačevski, A. & Đordević, T. (2015): Aluminium phosphate-sulphate (APS) minerals in the Gornja Lipa deposit, Bor district, Serbia. Poster, MinPet 2015, Leoben, Austria, September 10-13; abstract in Mitt. Österr. Mineral. Ges. 161, 30. 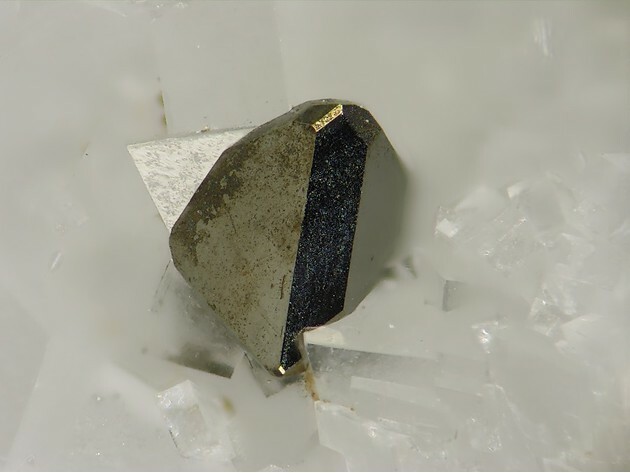 Harrison et al., Mineralogical Record 45:553-570 (2014). Anthony, J.W., et al (1995), Mineralogy of Arizona, 3rd.ed. : 120, 252; Graeme, R. (1993), Bisbee revisited, Min.Rec. : 24: 421-436. Anthony, J.W., et al (1995), Mineralogy of Arizona, 3rd.ed. : 182; Barnes, R. & M. Hay (1983), Famous mineral localities: The Magma Mine, Min.Rec. : 14: 72-82; Hammer, D.F. & D.W. Peterson (1968), Geology of the Magma mine area, AZ, in J.D. Ridge (editor), Ore deposits of the United States, 1933-1967, A.I.M.E. : 1282-1310.
ⓘ Needle Mountain District (Tacoma District; Florida District; Vallecito District) ? Am Min 79:750-762.; Econ Geol (1994) 89:602-627; Gobla, M.J. (2012) Montana mineral locality index. Rocks & Minerals, 87, #3, 208-240. Can Min 19 (1981), 423; Roberts et al., "Encyclopedia of Minerals". Van Nostrand Reinhold Co. 1974; Dana 7:I:387.